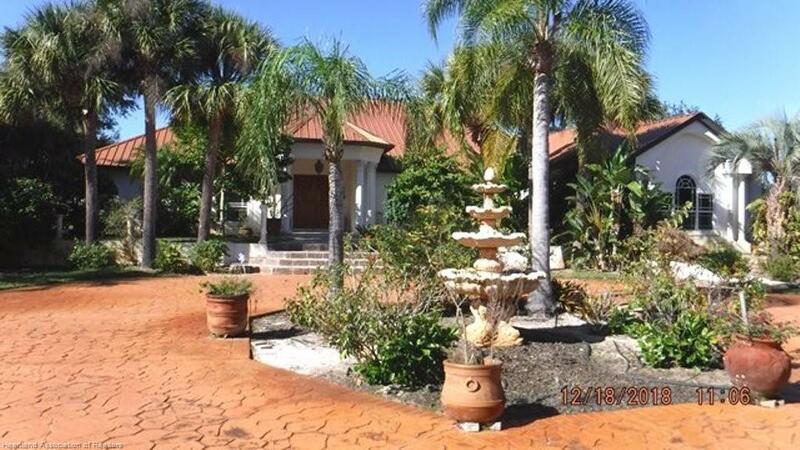 A grandly styled designer plantation home on 10.27 fenced acres. Automatic gated front entry with speaker system has winding drive and cobble stoned entrance. Lushly landscaped round-about with fountain. Extremely well designed and constructed, upon entry you are greeted with an expansive view of the living room, family room with art display insets and large lanai with custom bar and BBQ area. The user friendly kitchen with Corian counter tops is over sized with plenty of storage and counter space and is equipped with a pantry and walk-in cooler pantry fit for a restaurant. The master suite has coffered ceilings and lavish master bath. Each bedroom has a walk in closet and its own private bath. Large hallway closets give extra storage. Side 3 car garage. The land is mostly in a natural state, backs up to large, open land. The value is for sure is here. This house combined with 10 acres of land is very special. Someone looking for open and unique floor plan will love this house.